This tutorial shows how to prepare your local machine for Java development, including developing Java apps that run on Google Cloud Platform (GCP). Follow this tutorial to install Java and relevant tools. Install a JDK (Java Development Kit). Install a build automation tool. (Optional) Install an IDE or editor. (Optional) Install IDE Cloud SDK Plugin. Install the GCP Client Library for Java. JAVA_HOME: Points to the base of the JDK installation. 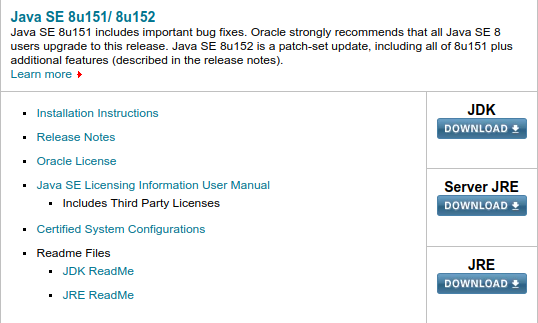 To install the Java 8 SE JDK on Windows, open the Java downloads page and find the most recent Java SE 8 package section. Agree to the terms and conditions, and then download and run the appropriate installer package. To install the Java 8 SE JDK on macOS, download and run the Mac installer. If the Java 8 SE JDK isn't available on your Linux distribution, open the Java downloads page and find the most recent Java SE 8 package section. su -c "yum install java-1.8.0-openjdk-devel"
Apache Maven, Gradle, and SBT are package management options that can help build Java app dependencies quickly and consistently across platforms. The Cloud SDK is a set of tools for GCP. It contains gcloud, gsutil, and bq, which you can use to access Compute Engine, Cloud Storage, BigQuery, and other products and services from the command line. You can run these tools interactively or in your automated scripts. These editors (sometimes with the help of plugins) give you everything from syntax highlighting, intelli-sense, and code completion to fully integrated debugging capabilities. For access to helpful functions within your editor, check out the Google-sponsored plugins for Eclipse or IntelliJ. Use the GCP Client Library for Java to integrate with GCP services, such as Cloud Datastore and Cloud Storage. You can install the package for an individual API, such as BigQuery, as shown in the following example. To run the client library, you must first set up authentication. If you are developing in the App Engine standard or flexible environment, you can use plugins for both Apache Maven and Gradle build tools that provide convenient functions for developing, testing, and deploying your apps directly. Add the Maven App Engine Plugin or Gradle Plugin for App Engine standard environments. Add the Maven App Engine Plugin or Gradle Plugin for App Engine flexible environments. Browse the documentation for GCP products. Clone the Java samples repository from GitHub. Explore Java tutorials submitted by the community.